Let us introduce ourselves. We are Ron and Barb Bergquist and A Block Away Quilt Shop is our creation. Barb is a dedicated quilter. A friend got her hooked on quilting in about 1990. Until the day she walked into her first quilt class with her friend, Jane (yes that is her name), she did not consider herself a creative person. In her work life, she was an IT professional. Though intimidating to most folks, she earned her degree to work on computers and learned that it was just a matter of know what keys to press. Nothing creative about that. But qu ilting doesn’t have keys to push that just makes it all work. So she was intimidated by the fabrics, the colors, the thread, the supplies, the tools, the patterns. But with patience and time, she learned about quilting and discovered that she does have one or two creative bones in her body. Now, more than 25 years later, she is still creating works of art out of fabric. Some are amazing; some, well, she will admit that she has done better. Spoken like a typical quilter! Ron was also an IT professional in his day job, but for years, a rock-n-roller by night. He makes amazing music when he sits down long enough to pick up one of his guitars. But more importantly, he loves Barb and has marveled at the joy that quilting brings her. So much so that he decided to learn how to service and repair sewing machines. Now Barb doesn’t deal with the frustrations of running into problems with her sewing machine. Should something not work right, Ron makes it purr as she is out shopping for more quilt fabric! Now about A Block Away. To make a long story short, we spent a few summers in the Blue Ridge Mountains of southwest Virginia. We could spend hours telling you how wonderful that area is, but for the sake of shortness, we will take the direct route. Where we were located in the mountains, we were surrounded not only by the beauty of nature, but also by the history of the people who live there. They take pride in what their ancestors have taught them, and that is the old-time music and crafts. Well, we just fit right in with Barb’s love for quilting and Ron’s love for music. Ding! A light goes on. Why not open a quilt shop?! So Ron and Barb started research with the goal of opening a brick and mortar shop somewhere. It was a long process and trying to decide where to locate the shop was difficult. We were so excited to get going that we started with an online shop in late January 2016, working out of our home. That wasn’t enough for us though and in mid-December 2016 we had our soft opening at our brick and mortar shop in McAllen, TX. In the end, we decided to open near our home in the Rio Grande Valley. Later, we knew that we had made the right decision to open here when at our official grand opening on January 6, 2017, our wonderful customers packed the shop to celebrate with us and support our efforts. Wall to wall with folks holding bolts of fabric, the Chamber of Commerce finally interrupted everyone so Barb and Ron could take a brief break and officially cut the blue ribbon making it official. Those same customers are still loyal today and their support is helping us grow to better serve all the quilters (and soon-to-be-quilters) in the Rio Grande Valley. But getting back to the name. Are you wondering about our name? Well, it tells the short story of our initial motivation – to have a quilt shop close to us. A Block Away will do, right?! Our dream is simple. We love quilting and we love people. We want a quilt shop that is a community for quilters. 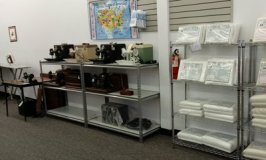 It will be more than a place to go for quilting fabrics and supplies. Our dream is to bring people together. 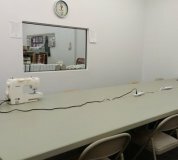 We want unite the quilters in the area and make our shop a meeting place for them to share their craft and learn together. We want to provide classes and sponsor clubs. 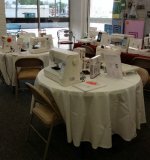 We want to give back to our community by providing classes to teach everyone who is interested the art of quilting. We want to share our space with others who are creating handmade quilts for charity. Our shop will become a gathering place for people who are working on a quilt project and just want work together. Our dreams are big and our ideas are endless. It’s about community. 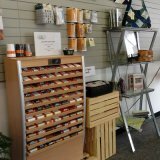 We started with an idea; then we created an online shop and now we run a physical shop. As long as we can, we will continue to grow, but we know that we can’t do this alone. It’s going to take you helping us. Please share your thoughts, your feelings, your questions and your knowledge too. We will always give you credit. Explore our shop online or in person, buy some things for quilting, sign up for our newsletter, take a class or join in with other shop events, and share us with everyone you know. We can become a community, a quilting community. When owners, Ron and Barb, aren't working at the shop, Barb loves to explore the outdoors and capture it's beauty through nature photography. Ron enjoys playing the guitar and is learning to play the banjo. While we have our own personal pursuits, we are united in our goal to support the creative needs of quilters, and are dedicated to providing our customers with the best quality and service possible!